Acute inflammation is your body’s natural immune response to damage. This type of inflammation happens as a result from injury or trauma like when you take a fall or accidentally cut yourself. Your immune system sends a rush of white blood cells to the site of your injury to repair the tissue. In this situation, inflammation is your friend—you can’t live without it. Chronic inflammation is your body’s immune response to a barrage of environmental, physical and mental invaders. Sometimes this stems from things like poor diet, stress, lack of sleep, toxic chemical exposure or an imbalanced gut. When your body is out of balance inflammation can be at the root of these feelings of discomfort or pain. This type of inflammation is what medical researchers are finding is the root of almost all disease. What can you to do fight inflammation? Reduce trigger foods that you may be sensitive to. Common one’s are gluten, dairy and soy. Eat a whole foods, predominantly plant based diet. 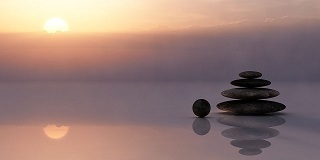 Destress; in the new year commit to a consistent routine like doing yoga, walking with friends or hitting the gym a few days a week. Rest more. Get at least 8 hours of sleep a night. Your immune system will thank you. Reduce toxins in your home by switching out your cleaning products and personal care products such as soaps, shampoos and lotions. Jump start your bodies inflammation response. 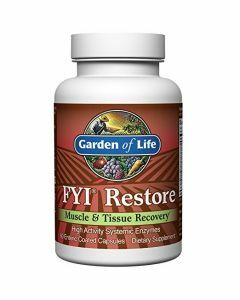 We recommend you try a natural restorative product for inflammation like FYI Restore by Garden of Life. FYI Restore is the ultimate broad spectrum systemic enzyme formula, delivering high proteolytic activity at the systemic level to work with the body’s own processes to assist normal tissue repair. 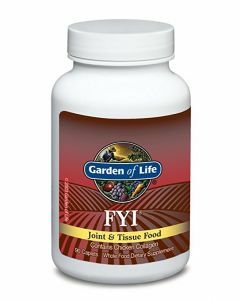 The synergistically balanced whole food, herb, and enzyme blend by Garden of Life FYI, consists of cartilage building proteins from chicken collagen, systemic enzymes, and specific whole foods and herbs chosen for their proven anti-inflammatory abilities. Not only may the nutrients in FYI help to control and prevent inflammation, they have no side effects whatsoever and may, often times, prevent the occurrence of unwanted side effects caused by prescription medications. Another great product is FYI ULTRA . This is one of the few vegetarian products for inflammation which aids both joints and cartilage. It is made from natural shellfish-free glucosamine, antioxidants and botanicals. 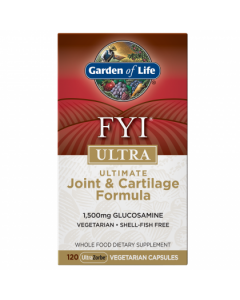 It is the only product in the Garden of Life line that contains glucosamine. Contains glucosamine which supports the body’s ability to rebuild cartilage tissue and maintain healthy joints. Contains pomegranate, selenium, natural astaxanthin, and Boswellia to support the body capacity to withstand free radical damage in joint and cartilage tissue.